"In El Salvador there are pupusas. In Mexico there are tacos. In Honduras there are Baleadas. The simple version consists of a thick flour  though sometimes corn  tortilla that has been put on a charcoal grill. 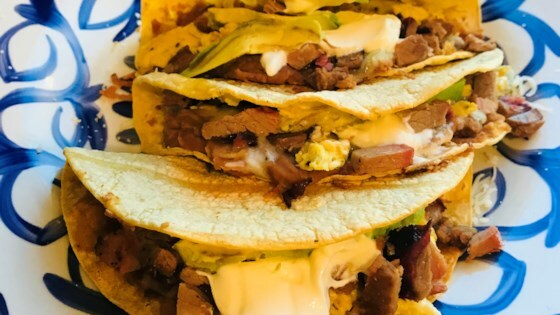 It's slathered in refried black beans and a bit of white farmers cheese then folded over like an American-style soft taco." Mix flour, water, vegetable oil, egg, and salt in a large bowl; knead until dough is smooth and no longer sticky. Form the dough into 8 golf ball-sized balls. Cover and let rest, about 20 minutes. Stretch each ball of dough into a thick tortilla. Heat a large skillet over medium-high heat. Cook each tortilla until browned and lightly puffed, about 1 minute per side. Layer refried beans, avocado, and queso fresco over tortillas. Drizzle crema on top; fold tortillas in half over filling. Substitute lukewarm milk for the water if desired. I’ve been trying to make these for so long and I couldn’t. They either stick or were too hard but this recipe is the one and it tastes delicious. It came out great, and I agree with other posters with it needing at least 2 more cups of flour for the tortillas to take form.